Biometric sensor is a transducer that converts a biometric treat like voice, fingerprint, face, iris of an individual into an electrical signal. Escalating application of wearable and portable biometric devices is likely to drive the growth of biometric sensors market over the forecast period. Rising digitalization and financial establishments are concentrating on biometric alternatives for secure and better operations. Increasing incidences of identity and data theft is fueling the demand for advanced biometric systems, which in turn is having a positive impact on the market for biometric sensors. Research centers, hotels, commercial centers, offices, airports, financial centers, and educational hubs are some of the key end user of the biometric sensors. High security defense academies are also opting for advanced biometric systems in order to secure the crucial information. Defense and army offices are key areas where biometric systems are installed for better operations. The global biometric sensors market was valued at US$ 969.4 million in 2017 and is expected to witness a CAGR of 8.3% during the forecast period (2017 – 2025). Global financial movements are becoming digitalized, several banks are employing novel technologies such as, next generation identification measures, to battle fraud, make transactions more safe and secure, and to improve the customer experience. In order to authorize monetary transactions, business clients simply place a finger inside a small desktop scanner than entering PINs or passwords. This technology is considered highly protected, owing to the distinctiveness of individual’s finger prints. Application of fingerprint readers along with biometric lock system in luxury hotels is one of the driving factor for the market. Government organizations are also opting for biometric systems for better management of employee attendance, which is another prime reason for the growth of market. North America is expected to gain major traction over the forecast period, due to increasing application of biometric sensors in different industries for security in the U.S. and Canada. However, high cost of installation and maintenance of the whole biometric system are some of restraining factors for the market. Developing technological advancement in wearable consumer electronic gadgets is boosting the application of biometric sensors which senses the body temperature, heart rate, and other major attributes of the individual who is wearing the device. Growing implementation of fingerprint sensors in smartphones drives the growth of the market. Increasing application of biometric sensors in cars for better driving experiences is another driver for biometric sensor market globally. Biometric identity features in luxury cars comprises fingerprint, voice, gesture, and iris recognition, which are some the major attributes fueling the demand for biometric sensors. North America is leading the market, followed by Europe. Proliferation of biometric sensors in educational centers, research laboratory and hospitals is fueling the market. The biometric sensors are often exposed to potential challenges, which may manipulate them compromising the security of the system. These factors hinder the growth of the market over the forecast period. Strategic partnership agreements with raw material suppliers along with merger and acquisition are some of the prime business strategies followed by the companies operating in the biometric sensors market to strengthen foothold in the market globally. Biometric sensor is a transducer that transforms a biometric treat for instance voice, fingerprint, face, iris among others of an individual into an electrical signal. The sensors primarily measures as well as delivers pressure, temperature, light, electrical capacity, and speed or other categories of energies. Numerous wearable devices, such as smart bands, smart watches, ear pods, and smart eyeglasses include biometric identification competencies in order to identify a person's biometric characters, which includes blood pressure and heart rate. The mounting usage of wearable and portable biometric devices is expected to thrust the growth of biometric sensors market over the forecast period. Increasing consumer inclination towards smart phones is also one of the major reasons behind the growth of biometric sensors market globally. Increasing application for in-car-biometric sensors in luxury cars for better driving experiences is boosting growth the growth of biometric sensor market globally. On the security side, biometric identity features in luxury cars comprises fingerprint, voice, gesture, and iris recognition, which is contributing in the positive development of the market. Advantages of using fingerprint scan, iris scan, palm, and facial recognition to safely operate bank lockers is another major growth boosting factor for the biometric sensors market globally. This report segments the global biometric sensors market on the basis of product type, application, end use industry, and geography. On the basis of product type, the biometric sensors market is categorized into optical sensors, thermal sensors, capacitive sensors, electric field sensors, and ultrasound sensors. On the basis of application, the market is segmented into voice scan, hand scan, finger scan, iris scan, facial scan, middleware, vein scan, and others. 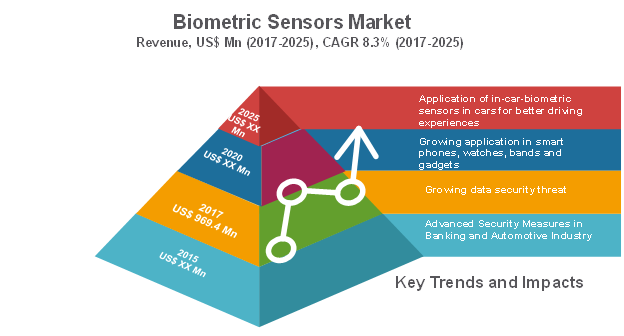 On the basis of end-use industry, the biometric sensors market is categorized into automotive, hospital, commercial center, consumer electronics, educational hubs, banking and financial sector, research labs, and others. Consumer electronics segment is furthermore categorized into smart phones, smart watch, and other smart gadgets. For comprehensive understanding of market dynamics, the global biometric sensors market is analyzed across key geographical regions namely Latin America, North America, Europe, Asia Pacific, Middle East, and Africa. 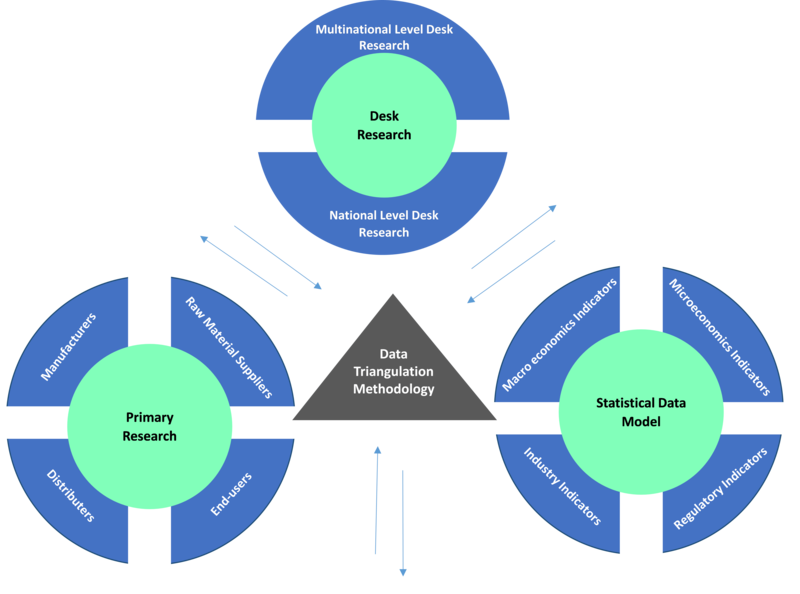 Each of these regions is analyzed on basis of market findings across major countries in these regions for a macro-level understanding of the market. This report provides in-depth analysis of the Biometric Sensors market with respect to its applications, end use industry, market size (US$ Million), and Cumulative Annual Growth Rate (CAGR (%)) for the forecast period: 2017 – 2025, considering 2016 as the base year. It profiles leading players in the global Biometric Sensors market based on the following parameters – company overview, financial performance, product portfolio, geographical presence, distribution strategies, key developments and strategies, and future plans. Key companies covered as a part of this study include 3M, Crossmatch Technologies Inc., Idex Asa, Infineon Technologies Ag, Fulcrum Biometrics, Safran, Precise Biometrics Ab, NEC Corporation, Zkteco Inc., and Suprema Inc. 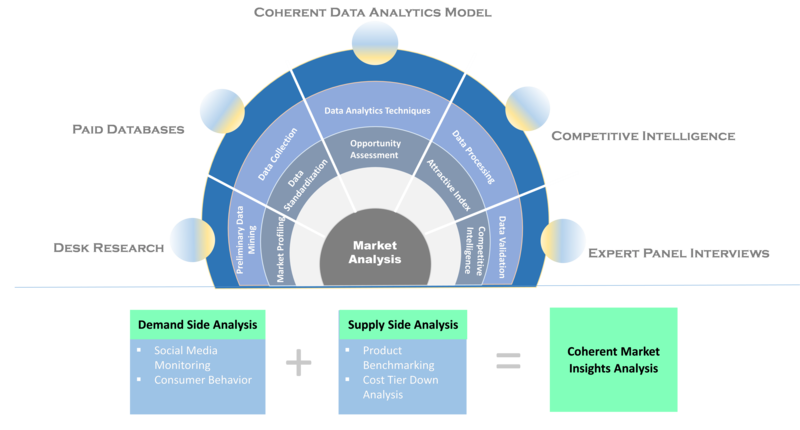 Insights from this report would allow marketers and management authorities of companies to make informed decision with respect to their future product launch, end Use Industry upgrades, market expansion, and marketing tactics. The global Biometric Sensors market report caters to various stakeholders in this industry, including investors, product manufacturers, distributors and suppliers for Biometric Sensors market, research and consulting firms, new entrants, and financial analysts. *Browse all the market data tables and figures on "Biometric Sensors Market - Global forecast to 2025”.